Welcome Dog Is Good Customers! Dog Is Good is excited to partner with Pet Hotels of America to provide you with the lowest rates at pet friendly hotels in America. Plus, many of the hotels offer excellent pet perks to make sure you and your animal are welcomed wholeheartedly. To make your travels even easier, Pet Hotels of America also provides listings with maps for nearby pet friendly parks, beaches, hikes, restaurants, interesting places to visit, tours, shopping, pet events, veterinarians and much more in cities throughout the U.S.
Dog Is Good products may be found at Traveling Pet Supplies. 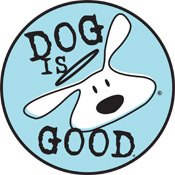 Dog is Good has developed a reputation for generously giving back to animal welfare organizations at the national level and throughout the United States. Thank you for being part of our drive to improve the lives of all animals.